Roquetas de Mar is rapidly developing into one of the most attractive seaside resorts in southern Spain. It is popular with Spanish holidaymakers but increasing numbers of Northern Europeans are choosing to visit. Roquetas does not have the brash, mass tourism of other Spanish resorts. Life here moves at a much gentler pace but is far from boring because it provides the visitor with both the facilities of a city and the relaxation of beach life. The town used to be a fishing village and the area around the old port is particularly attractive with a sensitive mix of new apartment blocks and old fishermen's houses. Adjacent to the port area is the Castillo Santa Ana, which was built on the site of the old castle. It is currently used as an exhibition centre but rumour has it that it will, in future, be the home of the Roquetas Museum of the Sea. Next to the castle is the old lighthouse. The resort has several miles of sandy beaches, all with blue flag status. They stretch from Aguadulce in the east to the Natural Park of Puntas Entinas-Sabinar in the west. In between are the districts of Las Salinas, Roquetas old town and the Urbanización.The up-and-coming Las Salinas area of Roquetas is set on the vast plains of salt flats at the foot of the Sierra de Gádor.The main tourist area is called the Urbanización de Roquetas de Mar. Its attractive promenade is fringed with palm trees. There are a number of British and German hostelries but they intermingle with Spanish ones. 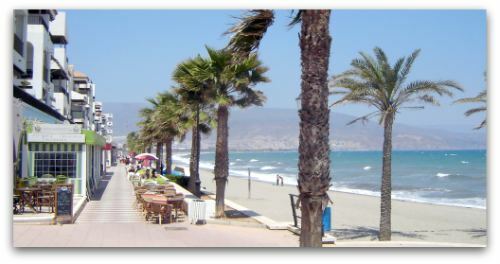 Aguadulce is part of the municipality of Roquetas de Mar but it is a separate but equally appealing resort with a fine marina. Roquetas has a number of attractions that include the Aquarium, the Mario Water Park, the bullring, the Theatre Auditorium, cinemas, museum, and boat trips. For those interested in activity holidays there are, golf courses, ten-pin bowling, sport centres and numerous cycle lanes. 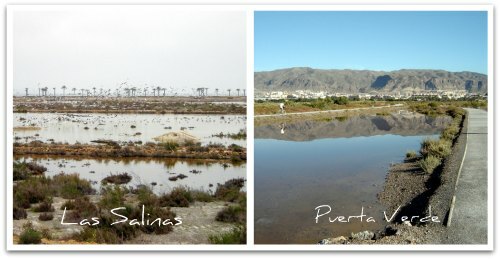 Walkers and bird-watchers can enjoy two natural areas in Roquetas, thePuntas Entinas-Sabinar Natural Park to the west of the town and the Parque Las Salinas. In particular the Puerta Verde de Roquetas de Mar is a recently opened short route in the Las Salinas area that enables beach users, walkers and cyclists to enjoy use of the Cañada Real de la Costa without encountering motorized traffic. It is part of a 15 kilometre pedestrian route between Aguadulce and the eastern end of the Puntas Entinas-Sabinar Natural Park. Include this natural park in the expedition and the more intrepid walker can make a near 30 kilometre trek along the coastal strip, which is part of the unspoilt coastline of the Costa Almería. Roquetas is also suitable for the less able because, despite the close proximity of some of the highest mountains in Spain, the town itself is flat. Quite apart from the aforementioned attractions and amenities there are plenty of other things to do. All along the Spanish coastline and in the inland villages there are frequent celebrations to honour various patron saints. Roquetas is no exception. It has a number of festivals during the year. The most important celebration being in honour of the Virgen del Carmen and Santa Ana that takes place every July with a maritime celebration. During the summer months, Roquetas Town Council puts on numerous open-air concerts. These performances cater for all tastes including as they do flamenco, pop, jazz and classical music as well as shows for children. Entrance is free. There are occasional free concerts at the theatre that opened around five years ago. However, we do have to pay to see artists like Montserrat Caballe and Jose Carreras who have appeared there.With all it has to offer, Roquetas de Mar has become one of the major tourist attractions on the Mediterranean coast. There are some delightful natural areas just a short drive from Roquetas. 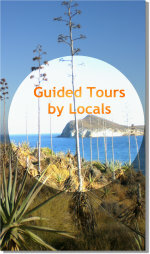 The Cabo de Gata Natural Park is less than one hour's drive from Roquetas. The cape itself is visible across the bay and beyond that there are the unspoilt beaches and unique wildlife of the protected coastal reserve. It is also only an hour's drive to the Alpujarras - that delightful area of picturesque white villages that cling to the southern slopes of the Sierra Nevada. It is but half an hour's journey if one accepts that the mountain village of Enix is, in fact, part of that delightful region made famous by writers Gerald Brenan and Chris Stewart. Certainly, on arriving at the village in the Sierra de Gádor there is a sign welcoming visitors to the Alpujarra Almeriense. As far as I am concerned it is just one of the delightful mountain villages to visit whenever I wish to go for a short drive from the coastal resort of Roquetas de Mar which, incidentally has over 300 sunny days per year. No wonder the welcoming signs in Roquetas say "Roquetas de Mar también en invierno" - also in winter! 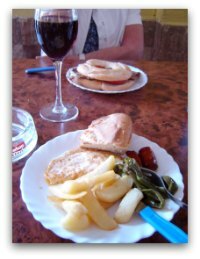 As befits a tourist town, there are very many bars and restaurants in Roquetas. Many of them are Spanish but there are English and German bars as well as Chinese, Indian Italian, French and International restaurants. There are lots of establishments that provide tapas with one’s favourite beverage including a handful of British bars that participate in this delightful custom. Full English breakfast is also provided in some of the British bars in the Urbanización although I prefer "el desayuno" in one of the many Spanish cafes. In Avenida de las Marinas, El Marinero’s tapas are excellent value and include paella, migas and even plato alpujarreño – the Spanish equivalent of sausage, bacon egg and chips! 'Pepe’s Bar' in Calle Américo Vespucio must be one of the best tapas bars around both in price and quality. Also the establishment is spotlessly clean. 'Café Bar Europa' in Avenida de Carlos III (El Parador) is a typically noisy Spanish bar and the tapas are good, especially their carne con tomate. The also serve up delicious raciones of mixed fried fish. 'Café Bar Avenida' in Juan Carlos Avenue does a good range of tapas. I particularly like their pinchos. In Calle de Sierra Nevada, 'Lady Lay' serves very good English meals at very reasonable prices. They also serve tapas. Another bar that serves English tapas is 'Aurora'. It is on the seafront near the port. 'Café Bar Real' in Juan Carlos Avenue is a pleasant place to have breakfast, as is Pastelería Artesana Delicias in Plaza de Roma, which also makes delicious cakes and pastries. 'Cruz y Garcia' on the corner of Calle San Vincente and Avenida Rector Gustavo Villapalos is a good place to visit teatime for its delicious cakes. For churros and chocolate, I recommend 'Cafeteria Churreria Plaza'. It is located in the El Parador district – in Calle de Hortichuelas. For menú del día or ‘a la carte there are a number of good restaurants including 'El Bodegan' in Avenida de la Gaviotas. Robert Bovington is an English writer of books about Spain. These include Spanish Matters, Spanish Visions and Spanish Impressions. The author was born in Brighton, England in 1945. After many years working in the telecommunications industry and then in education, he and his wife, Diane, made the life-changing decision to relocate to Roquetas de Mar, a coastal town in southern Spain. Lazing on the beach was not their idea of fun, however. They wanted to explore their new homeland. It didn't stop there! Robert Bovington was so impressed with his new homeland, its countryside, its historic cities and its culture that it inspired him to write about his experiences.